Lil Smug Pug: Snow/Ice and My First Poached Egg! So last night was pretty snowy and icey here and my lil pug HATES it. She never likes getting her dainty lil paws wet. We tried out her new coat which I loved but she...not so much. She likes it better than the dreaded koala hat or her too snug sweaters. I got this from Etsy so I was able to specify the measurements and so it fits perfectly. The D-link on the sweater is surprisingly strong too but Sunny's not used to having the leash attached at her back and she did not like it at first. She kept trying to shake the coat off but that sucka did not budge. Dang do you see how many "friends" my pug has? She's so lucky. I love how she likes to pile all her toys together on her crappiest bed (I've tried getting new beds for her and she likes this one the best for some reason). 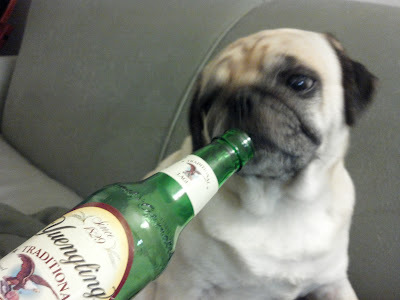 I think my pug has a better life than me. I love my one egg double-sided pan but it's a fine balance between getting the egg white cooked right (and not overcooked and hard) and keeping the yolk nice and runny. I've always loved poached eggs in restaurants but the idea of poaching an egg myself was too daunting. After much obsession with poached eggs (thanks Pinterest) and some research on the internet I decided to try poaching an egg for the first time ever. I think poached eggs look so cute! I put a couple inches of water in my smallest pot (to avoid too much movement) and brought it to a boil. Then I lowered it to a simmer (only a couple tiny bubbles popping up to the surface) and added a splash of rice vinegar (the only vinegar I had in my kitchen). The vinegar is supposed to help the egg white solidify better and since my eggs are not that fresh I thought it best to help the process along somewhat. I poured in the egg that I had already cracked in a tiny bowl, very slowly, and then used a spoon to try to group together the whites. Some of the whites were separating and it was starting to look like a bit of egg drop soup and so I quickly covered the pot then and cooked for about 3 minutes. After the 3 minutes, I spooned the egg out onto a plate covered with a paper towel to absorb the moisture as I'd seen on the internet. After I prepared the rest of my salad I went to remove the egg and it stuck to the paper towel! I almost panicked and was worried I'd crack the yolk inside. So instead I flipped the paper towel over and let the egg fall into my hand. This actually worked out better because the messy edge of the egg stayed stuck to the paper towel and into my hand plopped a cute, round lil poached egg. I'm so pleased with my first poached egg! The rest of the salad is some leftover arugula from my previous pasta dishes this week, halved grape tomatoes, a couple slices of turkey bacon crumbled, a sprinkle of grated parmesan cheese, and a light splash of balsamic vinaigrette. But the real test is how does the yolk look? Here comes the fork test! Sorry the background is so messy! I have limited counter space and difficult lighting so I was huddled in a corner near my sink. I'm quite pleased with my first poached egg and my lunch in general. Very satisfying and delicious! I think the egg was a bit small for the rest of the salad so maybe next time I'd do two eggs. Notice how I decide to add an extra egg rather than just make the rest of my salad smaller. I don't do well with small portions! Now it's time to relax before I get ready for a quick run. Sunny is napping. I think she's a bit hungover from yesterday. Haha I kid! I kid! 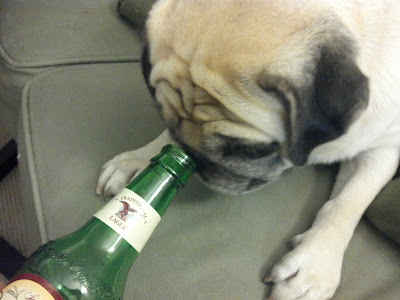 Of course I don't let my lil pug drink beer! She just likes to sniff at the bottle. Thanks for your quick reply about the bracelet! Did the chain snap because it was too snug around the wrist? I was thinking about ordering a length that would accommodate space needed when I bend my wrist. I really love the bracelet but now I'm kinda sad that it broke so quickly. Are you planning on getting other pieces? The first time the clasp broke because it got caught on a towel. That was a little unusual and I think I might have gotten a wonky one. After I got it replaced I had no problems with it for a while but then it broke when playing with my pug because her nail accidentally grabbed it and she pulled down and it broke. It had nothing to do with the snugness on the wrist since I got it a little longer for some extra room (I think I got 7 in or 7.5 in). Keep in mind that I usually don't change jewelry often so I am pretty rough with it - keep it on all day and sleep with it. I've had a necklace from Iwona that has lasted for years no problem. But I think the bracelet is a bit daintier and because it's on the wrist it gets caught on more things. I definitely plan on getting other pieces but maybe not the thin bracelets. I'm still planning on getting the skull bracelet fixed and wearing it again though because I really really love it. But I'll be much more careful with it going forward.